Whenever a new piece of hardware or updated version of iOS is released from Apple, it always seems to be built around certain decisions from within that cause a little bit of fuss and confusion. The iPhone 4S proved to be one of the fruit company’s most successful iPhone models to date, but the decision to include facial detection only for still image capture still proves to be a discussion point. The FaceDetectionVideo4S tweak within Cydia eradicates that issue for those who are still operating the fifth-generation iPhone. iPhone 5 owners will be well aware that their device is capable of detecting faces on both still image and video capture modes from within the native Camera app. Granted, the iPhone 5 is an updated piece of kit and comes on the back of an additional twelve months of hardware development, but it’s plainly obvious that the iPhone 4S is more than capable of having this functionality. An iOS developer by the name of PoomSmart clearly agrees, and has released FaceDetectionVideo4S as a free-of-charge Cydia download for those disgruntled 4S owners. The developer of the package has existing pedigree when it comes to unlocking certain features on Apple hardware that the company has chosen to not include. The installation of his latest 4S dedicated package will mean that all users will be able to flick to the video preview mode of the Camera app and immediately benefit from the all of the goodness that comes from detecting faces that are in view. It may not be a package with amazing functionality, but it has been proven from time and time again that some of the most popular Cydia installations are those that act as handy utilities like this one. Users of other devices will be able to install this package without any error, but it won’t actually do anything unless it is installed on a jailbroken iPhone 4S. FaceDetectionVideo4S doesn’t come with any additional options or preferences to configure and will manifest itself purely as an addition to the main Camera app. 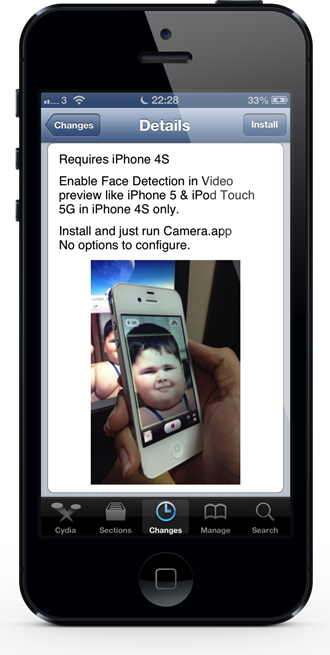 FaceDetectionVideo4S is available as a free-of-charge download from the BigBoss repository and requires a jailbroken iPhone 4S device. No information regarding iOS version requirements are provided by the developer.